Melissa M. Klimpel, ACP, is a native of Wishek, North Dakota. She joined the firm in 1995 and works in the area of Civil Litigation with Attorney Scott K. Porsborg, Brian Schmidt, and Scott's associate attorneys Sarah Kuntz and Austin Lafferty. Melissa attended the University of North Dakota and received a Paralegal Certificate from Bismarck State College in 2002. She received her Certified Paralegal designation in 2004 and her Advanced Certified Paralegal in Discovery in 2006. 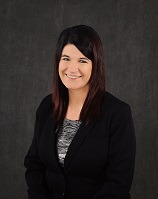 Melissa has been an active member of the Western Dakota Association of Legal Assistants (WDALA) since 2002. She served as President for four years, and also served as Co-First Vice President, NALA Liaison, Region III Director, and Newsletter Editor. Melissa has also been a member of the National Association of Legal Assistants (NALA) since 2005. She served as Area 2 Director and Region VI Director, served on NALA's Continuing Education Council, and was a member of the inaugural class of NALA's Leadership Enhancement and Preparation (LEAP) program. Melissa received NALA's Affiliated Associations Affiliate Award and Affiliated Associations Outstanding Contribution Award in 2012. Melissa and her husband, Mark, currently reside in Bismarck with their three active daughters, Whitney, Morgan, and Olivia. She enjoys spending time with family and friends, and traveling.